We are Action Appliance Repair. A locally owned, and operated appliance repair business specialized in full service home appliance repair in Las Vegas. 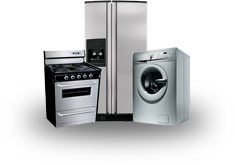 We are licensed to repair a wide variety of home appliances at affordable prices. Broken appliance? We can fix it... Today! If you are in need of appliance repair in Las Vegas, call us at (702) 742-2531 to schedule an appointment. We offer a convenient same day service for all repairs. We provide service to all of the Las Vegas area. We repair ALL major appliance brands and models. All of our repairs are guaranteed and are backed by a 3 month warranty. In addition to appliance repair, we SELL them! Looking for appliances? We carry a wide selection of brand name refurbished home appliances for sale. Our appliances are vigorously tested after refurbishment to ensure that they run properly and operate at peak efficiency. Our appliances are all backed by a 3 month warranty. CALL US FOR #1 QUALITY APPLIANCE REPAIR IN LAS VEGAS! ©2011 Action Appliance Repair. All Rights Reserved.